Hill was not targeted in Sunday's win against the Ravens. 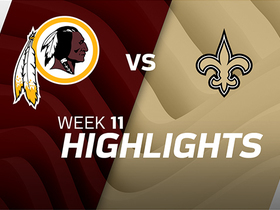 Analysis: Hill caught his first touchdown of the season Week 5, but he returned to his role as a blocker in Baltimore following the Saints' Week 6 bye. While he should continue to split snaps with Ben Watson, Hill remains an afterthought in the passing game and should probably not be used in most fantasy leagues. Hill caught two passes for 24 yards, including a one-yard touchdown, in Monday night's win against the Redskins. Analysis: Hill (38 snaps) and Ben Watson (36 snaps) continue to see approximately equal playing time, though Watson has outgained Hill in all but one of the team's first five contests. The touchdown was nice for those who rolled the dice on the former Idaho State Bengal, but Hill remains largely an afterthought in the Saints' passing game. With New Orleans on bye in Week 6, most fantasy owners should be seeking out other options. Hill caught all three of his targets for 63 yards in Sunday's win against the Giants. 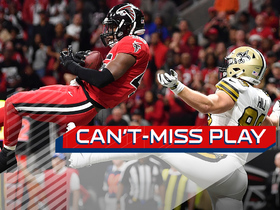 Analysis: Hill had exactly one catch in each of the first three games of the season, so it's probably best to chalk up his big game as an outlier. 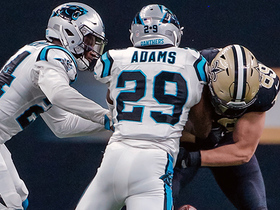 While the sixth-year pro has some decent skills as a receiver, he is primarily deployed as a blocker in the Saints offense and can still be largely ignored in most fantasy leagues. Hill caught his only target for 17 yards in Sunday's win against the Falcons. Analysis: Hill actually out-snapped starting tight end Ben Watson (49 snaps vs. 45 snaps), but Watson was far more active in the passing game, making five catches for 71 yards. Hill should continue to see substantial playing time but he remains primarily a blocker and probably does not need to be owned in most fantasy leagues. Hill caught his only target for five yards in Sunday's win against the Browns. Analysis: Hill played 39 of the Saints' 66 offensive snaps, sharing the field frequently with starting tight end Ben Watson, who saw 54 snaps. Still, Hill barely saw a look in the passing game and probably should not be owned in most fantasy leagues. Hill secured his only target for 15 yards in Sunday's loss to the Buccaneers. Analysis: Hill played only 24 offensive snaps compared to 51 snaps for Ben Watson. So long as Watson remains healthy, Hill shouldn't be anywhere near most starting fantasy lineups. Hill failed to reel in his lone target in Saturday's preseason game against the Chargers. Analysis: Hill has caught just one pass this preseason. While a valuable contributor to the Saints offense, particularly as a blocker, Hill is unlikely to contribute much to fantasy teams so long as Ben Watson remains healthy. 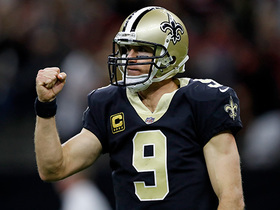 Hill (finger) took part in the Saints' June minicamp, Nick Underhill of The Baton Rouge Advocate reports. Analysis: Hill had offseason surgery to straighten out his left ring finger, which was bent at an almost 90-degree angle for much of last season. 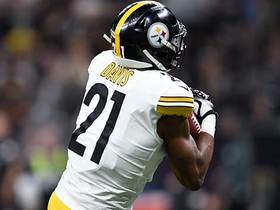 The procedure should help him with catching passes, though he'll likely play second fiddle to offseason tight-end acquisition Ben Watson on offense. Hill recently underwent surgery to straighten out a finger on his left hand but is expected to be ready for the Saints' Organized Team Activities in the spring, Herbie Teope of The New Orleans Times-Picayune reports. Analysis: A source familiar with Hill's situation said that the tight end's finger had been locked at a 90-degree angle prior to the procedure. There doesn't appear to be much concern about his recovery timetable given that the tight end was able to play through it this season, so Hill shouldn't face any limitations once offseason workouts begin. Hill caught three of six targets for 54 yards in Sunday's 29-24 NFC divisional-round loss to the Vikings. Hill (shoulder) doesn't have an injury designation for Sunday's game in Tampa Bay, Jenna Laine of ESPN.com reports. Analysis: Hill's role as the No. 1 tight end has yet to result in more than four targets in any game this season. The Saints are still heavily reliant on Mark Ingram, Alvin Kamara, Michael Thomas and, to a lesser extent, Ted Ginn. Hill (shoulder) was a limited participant in Wednesday's practice, Larry Holder of The New Orleans Times-Picayune reports. Analysis: Hill was nursing this injury ahead of his last two games but was able to suit up come game time. The fifth-year pro has been an afterthought in this run-centric offense in 2017, accruing just 15 receptions for 117 yards and one touchdown in 15 games. Hill (shoulder) does not have a designation on the final injury report for Sunday's game against the Falcons. Analysis: Hill's snap share fell between 63.5 and 67.2 percent each of the past four weeks, but he'll probably take on some added playing time in the absence of top backups Michael Hoomanawanui (concussion) and Garrett Griffin (foot). There still isn't any reason to expect more than three or four targets, as the Saints have leaned heavily on Michael Thomas and their running backs with great success all season. The team also gets Ted Ginn (ribs) back in the lineup for Sunday's game. Hill (shoulder) was a limited practice participant Wednesday, Joel A. Erickson of The Baton Rouge Advocate reports. Analysis: Hill played through the minor injury in Sunday's 31-19 win over the Jets, catching one of two targets for 22 yards while logging 66 percent of the snaps on offense. He should be available for Week 16 against the Falcons, but he's yet to top three catches or 29 yards in a single game this season. Hill caught one of two targets for 22 yards in Sunday's win against the Jets. Analysis: Hill played 45 of 68 offensive snaps (66 percent) but was again held in check. The Saints' starting tight end has not reached 30 yards in a game all season and can likely be ignored in the majority of fantasy leagues. Hill (shoulder) doesn't have a designation on the final injury report for Sunday's game against the Jets, Nick Underhill of the New Orlean Advocate reports. Analysis: A limited practice participant throughout the week, Hill never seemed to be in much danger of missing Sunday's game. He's played at least 63 percent of the snaps on offense in three straight games, but has just three catches for 22 yards on five targets in that stretch. Hill (shoulder) was a limited participant in Thursday's practice, Herbie Teope of The New Orleans Times-Picayune reports. Analysis: Hill hasn't put in a full practice yet this week, but the Saints haven't provided any indication he's in serious danger of missing the Week 15 matchup with the Jets. He'll likely serve as the Saints' top tight end in that contest, but that role hasn't translated to much fantasy value in recent weeks. Over his last five games, Hill has been targeted just seven times, hauling in five passes for 23 yards and a score. Hill (shoulder) was a limited practice participant Wednesday, Josh Katzenstein of The New Orleans Times-Picayune reports. Analysis: Hill leads all Saints tight ends in offensive snap count in 2017, earning 52.1 percent versus 48.3 percent for Michael Hoomanawanui and 31.7 percent for Coby Fleener. Because Fleener is out for the season due to a concussion, Hill is the best bet to get in the act weekly as a receiver. However, he's posted more than 20 yards in a given game twice in 13 games this season, so he doesn't hold much sway in the fantasy realm. Hill caught two passes on three targets for 14 yards in Thursday night's loss to the Falcons. 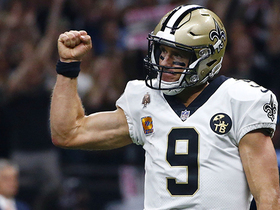 Analysis: Hill was the intended end-zone target on Drew Brees' game-sealing interception with under two minutes left in the game but the tight end never had a chance on the play. Hill also managed to not fumble the ball -- something he had done each of the previous two weeks -- so that's a step in the right direction, but the Saints' starting tight end largely remains an afterthought in the passing attack. Hill caught one pass for eight yards in Sunday's win against the Panthers. He also lost a fumble. Analysis: Hill's performance Sunday was a mirror image of the prior week, in which Hill also had just one reception, which he proceeded to fumble away. 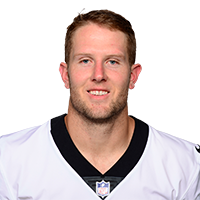 With Coby Fleener (concussion) placed on injured reserve earlier in the week, Hill played 43 of the Saints' 64 offensive snaps (67 percent). Still, the starting tight end remains an afterthought in the passing game, and fumbling in consecutive weeks may open the door for Michael Hoomanawanui or Garrett Griffin to see more playing time. 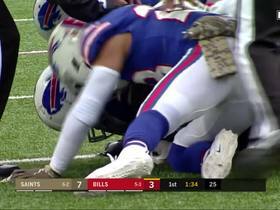 Hill fumbled away his only reception, a two-yard loss, in Sunday's win against the Bills. 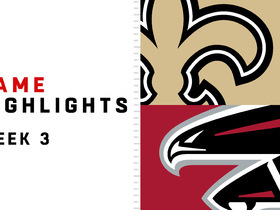 Analysis: Hill's red-zone fumble was the Saints' only turnover in a blowout victory in Buffalo. 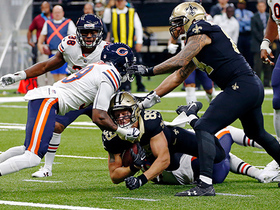 The nominal starter, Hill was actually out-snapped by fellow tight end Michael Hoomanawanui 47-43, though the Saints' tight-end trio of Hill, Hoomanawanui and Coby Fleener (17 snaps) combined for just two catches for two yards. A once fruitful position for fantasy owners, the tight end spot in New Orleans can be actively avoided until further notice. Hill was announced as the Saints' starting tight end ahead of Sunday's game against the Buccaneers, Larry Holder of The New Orleans Times-Picayune reports. Analysis: Hill will move to the top spot on the depth chart ahead of Coby Fleener, who has seen his role in the offense diminish the past three weeks, earning just five combined targets over that span. 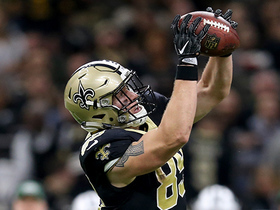 While it won't take much for Hill to best Fleener's production, don't expect him to emerge as more than a lower-end fantasy option at tight end with the Saints' offense skewing more run-oriented than in recent seasons.